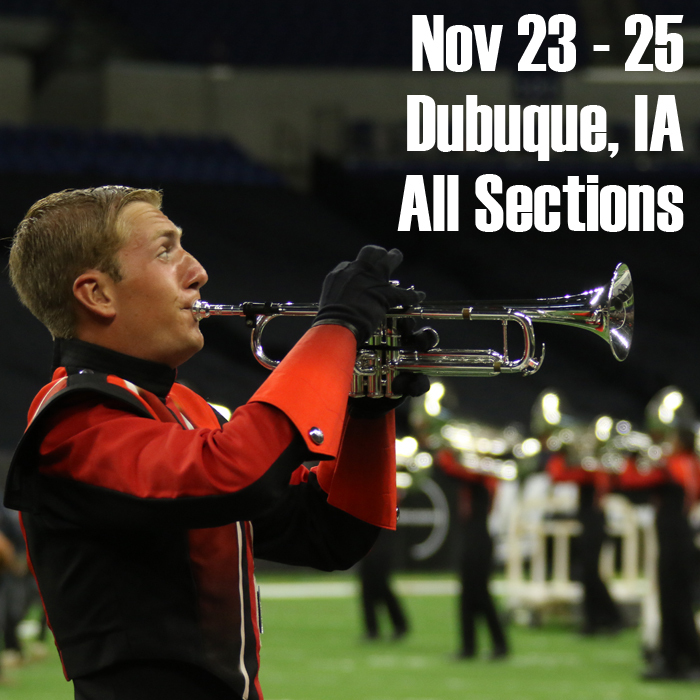 The first rehearsal and audition for the 2019 Colts will be held November 23 - 25, at the Five Flags Center in Dubuque, Iowa. The address of the facility is 405 Main Street, Dubuque, IA 52001. Click here for a Google map to the facility. The cost for your first rehearsal is $175 (or $125 for returning members), which includes all audition and application fees. Pay the fees online for your first camp in advance and SAVE $25. Deadline for advance payment discount for the camps is the Monday immediately before a camp at 11:00 p.m. This fee covers the cost of your audition and the event and does not apply toward your summer tuition. Always check colts.org within a few hours of leaving for Dubuque for any last-minute updates! Registration and unloading will begin at 6:00 p.m. on Friday. Rehearsal begins at 8:00 p.m., and will conclude at 3:00 p.m. on Sunday. Plan on arriving at 6:00 p.m. to register and unload equipment. We provide ground transportation anytime to and from the Dubuque Regional Airport (DBQ) for Dubuque camps. We can also accommodate flights into surrounding airports (Quad Cities, Madison, Rockford, or Cedar Rapids) but you MUST notify us prior to booking. MLI (Moline) and CID (Cedar Rapids) are very close to Dubuque and reasonable in fare. ORD (O'Hare) travel MUST land prior to 3:30 p.m. on Friday and depart no earlier than 7:30 p.m. on Sunday. Midway (MDW) travel MUST land prior to 2:30 p.m. on Friday and depart no earlier than 8:30 p.m. on Sunday. If you plan on using either of these airports, please let colts@colts.org know prior to booking flights. Parking is available after 6:00 p.m. on Friday in the city lot next to the Five Flags at the corner of 5th and Main Streets. Parking is also available behind the Holiday Inn, as well as in the Five Flags Center Ramp on the corner of 4th and Iowa Streets. As most of this parking is metered on Saturday, all should be sensitive and aware of where you park to avoid getting ticketed. RSVP. Regardless of your plans, submit an RSVP so we can keep you up to date. Be sure to include all necessary flight and travel information in the RSVP. If you need a ride from the airport, you will be notified by the Thursday immediately before the camp who will be picking you up. The RSVP should be submitted each month by interested students. Email a headshot of yourself to jason@colts.org. Include your name (first and last), section, and which audition camp you are attending. This picture is added to your audition file so our instructional team can quickly learn your name and face. This picture must be submitted before the camp starts and is required of all attending. Make sure the image is clear, well lit, and contains your whole face. And, as great as your sunglasses or Snapchat filters may look, they don't belong in your headshot. Colts Medical History Form. This form is required in order to audition. The medical form also provides permission to participate in our activities. Students 18 or older may sign their own medical form. Any student 17 or younger must have a parent or guardian signature to participate. Medical forms only need to be submitted once per year, unless your information changes. Be sure to complete both sides! Students stay overnight in the arena on the floor, as you will all summer. Bring changes of clothes, shower supplies, towel, sleeping bag and pillow, comfortable clothes for rehearsal (no jeans), and tennis shoes (no high tops). Many students will bring an inflatable mattress with a battery-powered air pump. Bring a binder with plastic sleeves for your music and any hand-outs. You will receive an audition t-shirt at check in to write your name on that you will wear for all rehearsal segments of the weekend. Don't forget to bring a water bottle! Color Guard: Bring lightweight, workout clothing for rehearsals (no jeans), black pants or shorts and a black shirt for Sunday's performance, your own rifle and/or sabre (if you can), and knee pads (definitely recommended). There is no need to purchase any special equipment for rehearsals. You will wear your audition t-shirt for most rehearsal segments through the weekend. Percussion: Bring your own sticks or mallets and your practice pad. Prospective members should be familiar with the exercise packet that best fits your area of interest. Cymbal should prepare a short phrase of your own choice musically and visually, in addition to the cymbal packet. Front ensemble students are expected to perform a short segment of a personal selection for the individual audition. We ask that you provide your own marching cymbals, sticks, and/or mallets, as well as a practice pad. We will provide all other instruments for camps. We will evaluate you individually, and as a part of the group. All positions in the corps are open. Following the weekend, you will receive 1) an offer of membership, 2) a recall for a second audition, or 3) a suggestion to come back again next year or to consider Colt Cadets. Most will receive a recall to a second rehearsal, so please plan accordingly. Recall auditions can be scheduled three weeks after your initial audition at one of our events. Attend early and attend often for your best chance at a position in the Colts. Camp attendance is critical to our and your success. If you cannot attend this rehearsal but are planning to attend an upcoming audition, you must be in touch in advance through the RSVP. It is important to communicate with your caption head as well. Too much communication is better than not enough. If you have schedule conflicts with our preseason rehearsals, talk with us. Attending part of the weekend is better than not attending at all. Do not lose your opportunity to perform with the Colts over a lack of communication. An informational meeting for parents will be held Friday evening at 8:45 p.m. Bring all of your questions! Schedules will be available at the check in table with locations for everything going on throughout the weekend. If you arrive at a random time throughout the weekend, the kitchen or check in table are great places to start with questions anytime you visit about where you can help. Parents are strongly encouraged to attend the weekend. Parental support is what makes the Colts successful, and you are needed to give the kids the incredible Colts experience we are known for. Also, this is the best way for you to find out about our program, meet other parents, and get comfortable with what this is all about. You will find a very welcoming and exciting opportunity here. Parents are welcome to stay overnight in designated rooms at the Five Flags Center with sleeping bags and air mattresses. If parents are interested in hotel accommodations, we recommend the Holiday Inn for this rehearsal, as it is attached to the arena in which we are rehearsing. Please call 563.556.2000 and ask for the Colts Drum Corps rate for $78.00 per night. For all events, we recommend the Hampton Inn for your stay in Dubuque. Please call the hotel directly at 563.690.2005, select the front desk, and ask for the Colts Drum Corps rate. Auditioning students are expected to stay with the group overnight in the arena. As always, email or call us with any questions you may have. Throughout the weekend, all items in the Colts Mall will be available for sale! The holidays are coming up soon, and the weekend will be a great time to purchase a present for your special someone! Anyone is able to purchase souvenirs - students, parents, friends, family, etc. The souvenir racks will be set up by the check in table, and you can purchase your items there. A performance including all participants of the weekend is held Sunday afternoon at the Five Flags Center. You will be amazed at the progress we make in just one short weekend. Specific time and details about Sunday's performance will be posted the week of camp and will be available on the schedules at the check in table. Welcome! We are excited to have you as a part of the Colts family!